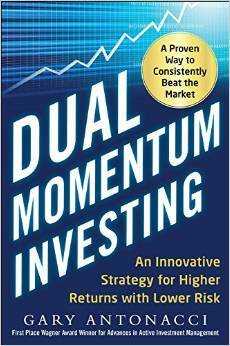 Gary Antonacci‘s forthcoming book Dual Momentum Investing: An Innovative Strategy for Higher Returns with Lower Risk (New York: McGraw-Hill, 2014) is currently Amazon.com’s top-ranked book for “momentum investing”. Antonacci’s 2013 paper ‘Risk Premia Harvesting Through Dual Momentum’ (PDF) contains a preview – including a great opening discussion of why the momentum anomaly exists in the stockmarket and why behavioural finance factors are likely to be involved. 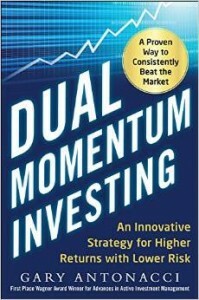 Antonacci distinguishes between two types of mometum strategies: (1) cross-sectional / relative momentum — used in long-short and index tracking strategies, and in the Relative Strength Indicator in ‘chartist’ technical analysis; and (2) absolute momentum – a time series phenomena where an asset’s prior price helps to determine its current price – used in trend-following. Antonacci’s dual mometum framework combines both types of momentum to extract alpha from volatile asset classes. He uses a modular approach to portfolio construction. Treasury bills provide an initial hurdle rate for relative momentum, with a 12 month lookback period. Antonacci then uses absolute return increase the basis point return, whilst decreasing the portfolio’s volatility and maximum drawdown. He has tested the dual momentum strategy in fixed income, equity, and real estate REIT asset classes, and with other market factors such as credit risk and economic volatility. Dual momentum investing is thus an alpha extracting strategy that combines two different forms of momentum to diversify the portfolio, and to lower volatility. The two different forms of momentum identify a set of market assets that are highly probable to appreciate in value in the near-term, particularly in periods of economic volatility. I suggest that momentum investors adapt to these market changes by possibly buying from distressed debt value investors near market lows that show signs of recent asset appreciation – and through identifying herding and overshoot conditions – selling to trend-following, news effect, and late-coming retail investors or mutual / pension fund managers. Thus, an understanding of game theoretic reasoning – as argued by the late trading psychologist Ari Kiev whilst at the hedge fund SAC – and population ecology models applied to market microstructure – might be helpful to momentum investors. Juemin Xu and Nigel Harvey, the study’s authors, took a sampling of 569,915 bets taken on an online sports-gambling site and tracked how previous wins and losses affected the probability of wins in the future. Over all, the winning percentage of the bets was somewhere around forty eight per cent. Xu and Harvey isolated the winners and tracked how they fared in their subsequent bets. In bet two, winners won at a rate of forty-nine per cent. From there, the numbers go haywire. A player who had won two bets in a row won his third bet at a rate of fifty-seven per cent. His fourth bet won sixty-seven percent of the time, his fifth bet seventy-two. The best gamblers in Las Vegas expect to win fifty-five per cent of their bets every year. Seventy-two per cent verges on omniscience. The hot hand, it appears, is real. The study’s findings have implications for the subjective judgment of independent events; the difference between skill and chance; the halo and winner effects due to hot hand streaks; and the survivorship bias of traders and funds who survive over a long period of time – until asset classes have alpha decay, and financial markets undergo market microstructure or regime changes. The New Yorker‘s commentary notes but does not explore the statistical edge that the best Las Vegas gamblers develop: the study suggests that such an edge may be situational or fleeting. This behavioural finance research is extremely useful to understand how cognitive biases can affect decision-making under uncertainty. 1. Excess return: fund type (hedge fund, private equity, venture capital); return drivers (including asset class); and quantitative models. 2. Active management: discretionary (human trading, portfolio composition and rebalancing, options, technical analysis) and algorithmic (algorithmic trading; complex event / stream processing; computational intelligence; genetic algorithms; machine learning; neural nets; and software agents). ORDER BY Bayesian (belief network, probability); return drivers (multi-asset); risk (exposures); and trading (algorithms). 1. What is the spectrum of possible return drivers in a multi-asset world? A good model for this is David Swensen’s Yale endowment portfolio detailed in Pioneering Portfolio Management: An Unconventional Approach to Institutional Investment (New York: The Free Press, 2009). Antti Ilmanen’s magisterial Expected Returns: An Investor’s Guide to Harvesting Market Rewards (Hoboken, NJ: John Wiley & Sons, 2011) has information on the return drivers of specific asset classes. Matthew Hudson’s recent Funds: Private Equity, Hedge Funds, and All Core Structures (Hoboken, NJ: John Wiley & Sons, 2014) deals with global fund structures. 2. What specific risk exposures might these multi-assets face, and under what conditions? Richard C. Grinold and Ronald Kahn’s Active Portfolio Management: A Quantitative Approach for Producing Superior Returns and Controlling Risk (New York: McGraw-Hill, 1999) is the classic book on institutional portfolio models. Morton Glantz and Robert Kissell’s Multi-Asset Risk Modeling: Techniques for a Global Economy in an Electronic and Algorithmic Trading Era (San Diego, CA: Academic Press, 2014) is a recent book I will look at. Charles Albert-Lehalle and Sophie Larulle’s Market Microstructure in Practice (Singapore: World Scientific Publishing Company, 2014), and Thierry Foucault, Marco Pagano, and Ailsa Roell’s Market Liquidity: Theory, Evidence, and Policy (New York: Oxford University Press, 2013) deal respectively with the practice and theory of contemporary financial markets. There are many books on behavioural finance and investor psychology: two recent ones are H. Kent Baker and Victor Ricciardi’s collection Investor Behavior: The Psychology of Financial Planning and Investing (Hoboken, NJ: John Wiley & Sons, 2014), and Tim Richards’ Investing Psychology: The Effects of Behavioral Finance on Investment Choice and Bias (Hoboken, NJ: John Wiley & Sons, 2014). 3. How can algorithmic trading and computational techniques model the risk-return dynamics of alpha generation? Despite its flaws Rishi K. Narang’s Inside the Black Box: A Simple Guide to Quantitative and High Frequency Trading (New York: John Wiley & Sons, 2013) opened my eyes to the structures needed for alpha generation. The Bayesian approach is detailed in David Barber’s Bayesian Reasoning and Machine Learning (New York: Cambridge University Press, 2012). Barry Johnson’s Algorithmic Trading and DMA: An Introduction to Direct Access Trading Strategies (London: 4Myeloma Press, 2010) and Robert Kissell’s The Science of Algorithmic Trading and Portfolio Management (San Diego, CA: Academic Press, 2013) deal with order types in algorithmic trading. Christian Dunis, Spiros Likothanassis, Andreas Karathanasopoulos, Georgios Sermpinis, and Konstantinos Theofilatos have edited a recent collection on Computational Intelligence Techniques for Trading and Investment (New York: Routledge, 2014). Eugene A. Durenard’s Professional Automated Trading: Theory and Practice (New York: John Wiley & Sons, 2013) covers software agents. For retail trader-oriented applications of data mining, machine learning, and Monte Carlo simulations there is Kevin Davey’s Building Algorithmic Trading Systems: A Trader’s Journey from Data Mining to Monte Carlo Simulation to Live Trading (New York: John Wiley & Sons, 2014), and David Aronson and Timothy Masters’ Statistically Sound Machine Learning for Algorithmic Trading of Financial Instruments: Developing Predictive-Model-Based Trading Systems Using TSSB (CreateSpace, 2013). What this means is that for an investment of about $US1,000 a new researcher can gain some of the core books on institutional, quantitative portfolio and risk management; behavioural finance and market microstructure as potential sources for edges; and some recent practitioner-oriented literature on algorithmic / automated trading that uses computational intelligence. Let a thousand algorithmic / quantitative micro-funds bloom. Preparation Material: Adam H. Grimes’ The Art and Science of Technical Analysis (New York: John Wiley & Sons, 2012); Margery Mayall’s University of Queensland sociological research on technical analysis; BusinessSource database search on academic research into technical analysis, and trader development and learning; and MarketPsych.com behavioural finance and psychological tests. (i) Identification of trading personal goals for 2013. (ii) Illustrative understanding of technical analysis as a trading methodology for alpha generation. (iii) Consideration of learning barriers to trader development. Technical analysis (TA) is the study of group psychology in financial market using price, sentiment, and volume indicators, and pattern recognition. It arose in a modern context due to Charles H. Dow and Richard Schabacker’s study of market patterns in the late 1800s-early 1900s. Robert D. Edwards and John Magee’s Technical Analysis of Stock Trends became the TA bible of market patterns later promulgated in variations by Martin Pring and others. Richard D. Wyckoff (the Wyckoff Method), Robert Prechter (Elliott wave theory), and other TA theoreticians have made influential contributions. TA focuses on identification of trends, retracements, breakouts, pullbacks, support and resistance. It anticipated some aspects of current academic research programs on behavioural finance and market microstructure but from a trader or practitioner viewpoint. Academics and traders remain divided on TA’s efficacy. In 1934, Alfred Cowles contended that a ‘buy and hold’ strategy beat Dow Theory trading. Early studies from 1966 to 1970 by Eugene Fama and his University of Chicago colleagues found that TA filter rules were unprofitable once transaction and execution costs were considered. Fama’s finding led academics to focus on the Efficient Markets Hypothesis, and, ultimately, mutual fund and passive index fund products. In contrast, TA became popular in the mid-late 1970s amongst trend-following Commodity Trading Advisors on volatile commodities and foreign exchange markets. The ‘housewives of Tokyo’ who speculated on currency movements now challenged the ‘gnomes of Zurich’ or institutional investment managers. Victor Sperandeo who traded for George Soros used Dow Theory. The bootlegged PBS documentary ‘Trader’ (1987) shows Paul Tudor Jones II and Peter Borish using Elliot wave theory and 1929 price data to predict a stockmarket crash in early-mid 1988. Finance theories in academic journals and hedge fund manager practices diverged into parallel universes. Recent academic research has shed new light on this academic-practitioner divide. In a review of 95 academic studies on TA from 1960 to 2004, Cheol-Ho Park and Scott H. Irwin found that “56 studies find positive results regarding technical trading strategies” (“What Do We Know About the Profitability of Technical Analysis?, Journal of Economic Studies 21:4 2007, p. 786). They note data snooping problems with Edwards & Magee-style pattern recognition which other academic researchers have also identified. Importantly, Park and Irwin found that TA was profitable in spot foreign exchange and futures contracts “from the late 1970s to the early 1990s” involving “unlevered annual net returns of 2-10%” (Park & Irwin 2007, p. 795). This finding reflects the period when Sperandeo, Jones, Borish, and other non-TA traders like Martin Zweig were ascendant in financial markets. It contradicts the earlier findings of Cowles and Fama that TA has always been unprofitable. Park and Irwin’s finding about TA’s period of profitability is also mirrored in other post-1988 academic studies. These find that the traders used arbitrage on anomalies; the transmission shocks of central bank monetary policies; the anchoring, crowded exits and rational herding of institutional investors; and changes to the international monetary system and political economy. However, these studies often fail to link their finding to the practitioner literature which offers independent confirmation, such as Jones II’s interview in Sebastian Mallaby’s More Money Than God: Hedge Funds and the Making of a New Elite (London: Bloomsbury Publishing, 2010). TA practitioners like Jones II were also often aware of the speculative bubble literature—Charles Mackay, Gustave Le Bon, Charles P. Kindleberger, John Kenneth Galbraith, and Hyman Minsky—which has inspired contemporary research in behavioural finance. This is why Gordon Gekko’s apartment in Wall Street: Money Never Sleeps (2010) had pictures from the Dutch Tulip bubble (1636-37). The conceptual gap between TA and behavioural finance is perhaps not as large for financial market practitioners as some academic researchers believe. The decline in TA profitability after the early 1990s can be attributed to changes in central bank policy coordination, market microstructure, and the growth of algorithmic trading. For instance, the Wyckoff Method identifies institutional trading and market patterns also found in Robert Shiller’s study of ‘irrational exuberance’ and speculative bubbles. But the growth of new trading—options, futures, and high-frequency systems—have altered what the Wyckoff Method found in pre-World War II financial markets. Collectively, the above developments over the past two decades have changed markets and volatility from trending to more range-bound dynamics. Edwards & Magee’s TA indicators, and support and resistance levels, can now be programmed into algorithms that actively trade against institutional and retail traders who still use traditional TA methods. This Darwinian-like evolution has led to the demise of dotcom era day traders (1995-2000), and trend followers who benefited from asset price valuations due to housing and commodities speculative bubbles (2003-2008). Academic researchers rarely refer to the TA practitioner literature beyond introductory books by Alexander Elder, Van Tharp, and other authors. Academics often state incorrectly that TA remains unstructured as a knowledge domain: Edwards & Magee, the Wyckoff Method, Elliott wave, Fibonacci, Japanese Candlesticks, and other major TA methods and schools each have their exponents and adherents. Instead, TA now involves an industry of books, consultants and custom indicators targeted at the retail investor. University of Queensland sociologist Margery Mayall found that TA indicators shaped the self-beliefs, mindsets, and decisions of the Australian retail traders who she interviewed. Some of Mayall’s retail traders became focused on the never-ending Holy Grail Quest to find the ‘right’ TA indicator or system. In contrast, proprietary trading desks now combine TA with behavioural finance, game theory, and market microstructure. Professional traders seek what Michael Steinhardt called contrarian ‘variant perception’ in financial markets compared with the ‘consensus perception’ of retail traders. There is always someone else on the other side of the trade even if it is a market-making algorithm. Academic researchers could bridge the gap with TA practitioners if the popular models were evaluated and back-tested in a more rigorous manner. However, recent work by Andrew Lo and other authors on rehabilitating TA remains at the interview or memoir stage, rather than using a robust empirical research design. Recent TA practitioner work by Adam H. Grimes, Xin Xie, Charles D. Kirkpatrick II, Julie R. Dahlquist, L.A. Little, David R. Aronson, and others looks promising. Grimes links TA and trader development to George Leonard’s Aikido model of self-mastery; to Daniel Kahneman’s prospect theory and behavioural finance study of cognitive biases; and to Mihaly Csikzentmihalyi’s study of creativity, flow, and optimal experience. This augments earlier work by the late Ari Kiev, Brett N. Steenbarger, and Mark Douglas on trading and performance psychology. Since circa 1992, a subset of TA academic research has also used genetic algorithms and high-frequency tick data analysis to identify trading rules. The findings from this research often either remain proprietary or reflect mathematical and quantitative models. Hedge fund managers who use TA are closer to Aaron C. Brown’s Bayesian risk managers who revise and update their beliefs. Such hedge fund managers are often aware of confirmation bias, the disposition effect, overconfidence, model risk, and other cognitive biases identified in the behavioural finance literature. Hedge fund managers and professional traders now use TA in a mixed methods approach – if they have not already been replaced by algorithmic trading systems. Another problem with the genetic algorithms research is that whilst it identifies trading rules it often does not include trader learning, risk and money management practices. These are what Sperandeo, Jones II, Borish and other TA traders use, and thus these practices modify the efficacy of the trading rules identified. For instance, the PBS ‘Trader’ documentary (1987) shows Jones II using deception and rumour – closer to the Chinese 36 Strategies – to mask his order size and to influence other traders. Academic researchers using genetic algorithms and other methods have often overlooked this cunning or metic intelligence. I resolved in 2013 to integrate TA’s relevant insights into a personal knowledge base and bespoke trading system for alpha generation. Academic research rigour can be combined with professional trading insights whilst retail trading myths promulgated by the TA industry and self-styled trading coaches can be avoided. A mixed methods research approach looks promising: where TA sees trends and retracements – a market microstructure researcher may see the interaction of strategic traders, order flow, and order types – and a behavioural finance proponent may find specific cognitive biases and decision heuristics. All three approaches look at the same market data via different lenses and vantage points. I took several MarketPsych.com tests to identify and to understand personal cognitive biases and psychological preferences. Once identified, I then compared the personal cognitive biases with past trades using an after action review approach. This illustrative research will inform operative action research to improve decision heuristics, mental models, and risk preferences for future alpha generation. Market Wizards: Interviews With Top Traders by Jack D. Schwager (Columbia, MD: Marketplace Books, 2006). (TS-3). Schwager’s interviews are frequently at the top of professional traders’ recommended reading lists for their insights into the personalities, backgrounds, decisions and different strategies of traders. Schwager’s follow-up books The New Market Wizards (Columbia, MD: Marketplace Books, 2008) and Stock Market Wizards (Columbia, MD: Marketplace Books, 2008) feature further informative interviews with different groups of traders. Useful for comparison with Brandt, Einhorn, Lewis, and Mallaby below. The Big Short: Inside the Doomsday Machine by Michael Lewis (New York: Penguin Books, 2010). (TS-3). Lewis (Liars’ Poker, Moneyball) profiles the Wall Street analysts and hedge fund traders who foresaw the 2007-09 global financial crisis: Steve Eisman, Mike Burry, Greg Lippman, Charlie Ledley, Ben Hocket, John Paulson and others. The Big Short how credit default swaps and other synthetics of financial engineering were created. Lewis exemplifies how ‘contrarian’ traders think and make trading decisions about financial markets: there is enough journalistic reportage in this book to actually model the trading strategies. For details of J.P. Morgan’s creation of collateralised debt obligations see Gillian Tett’s Fool’s Gold (Little, Brown, New York, 2009). For details of John Paulson’s ‘Soros trade’ see Gregory Zuckerman’s The Greatest Trade Ever (Penguin Books, London, 2009). For the best account of the negotiations behind the 2007-09 global financial crisis, see Andrew Ross Sorkin’s Too Big To Fail (Viking, New York, 2009). For further analysis of the business cycle implications, see Nouriel Roubini and Stephen Mihm’s Crisis Economics (The Penguin Press, New York, 2010). More Money Than God: Hedge Funds and the Making of a New Elite by Sebastian Mallaby (London: Bloomsbury PLC, 2010). (TS-3). Mallaby’s history of hedge funds – financial vehicles that enable pooled investors to speculate on stock-markets – has interviews and historical details which are unavailable elsewhere. More Money Than God explores how hedge funds have evolved over the past four decades, from journalist Alfred Winslow to philanthropy. There are interviews with George Soros, Julian Robertson, Bruce Kovner, Paul Tudor Jones, John Paulson, and details of David E. Shaw’s firm D.E. Shaw and James Simons’ Renaissance Technologies: two ultra-secretive quantitative hedge funds. As with Jack D. Schwager’s series on traders, this is an invaluable book for understanding how hedge funds actually work and the motivations of their founders. For some of the best academic research (and influenced by Isaac Asimov’s Foundation series) see Andrew Lo’s Hedge Funds: An Analytic Perspective (Princeton University Press, Princeton, 2010). For a comparison with ratings agencies, see Timothy J. Sinclair’s The New Masters of Capital (Cornell University Press, Ithaca NY, 2008). Fooling Some of the People All of the Time: A Long Short (And Now Complete) Story by David Einhorn (Hoboken, NJ: John Wiley & Sons, 2011). (TS-4). In 2002, hedge fund manager David Einhorn gave a speech advising investors to ‘short’ Allied Capital. Einhorn’s talk triggered a criminal investigation and maneuvers between Einhorn and Allied Capital. This book can be read as an investigation of corporate governance issues that foreshadowed the 2007-09 global financial crisis. Its primary value lies in revealing the research methods and decisions that a successful value-oriented fund manager uses; the accounting tricks that firms use; and how Kahneman’s biases and heuristics can influence hostile situations. If you want to understand the basics of corporate finance, valuation and fundamental analysis then see the McKinsey model in Tim Koller, Richard Dobbs, and Bill Huyett’s Value: The Four Cornerstones of Corporate Finance (John Wiley & Sons, Hoboken NJ, 2010). Diary of a Professional Commodity Trader: Lessons from 21 Weeks of Real Trading by Peter L. Brandt (Hoboken, NJ: John Wiley & Sons, 2011). (TS-4). Most trading books feature post facto selections of trade examples and market timing. Brandt’s diaries and technical analysis charts convey how difficult trading actually is; the importance of risk and money management; and the struggles to deal with Kahneman’s biases and heuristics. This book dispels the myths of day-trading success and much of the publishing books that Wiley Finance, McGraw-Hill and other publishers release. Thinking, Fast and Slow by Daniel Kahneman (New York: Farrar, Straus & Giroux, 2011). (TS-1). Kahneman (awarded the 2002 Nobel Prize in Economics) and his late colleague Amos Tversky pioneered the study of psychological biases and decision heuristics. Kahneman distinguishes between System 1 (fast, emotional) and System 2 (slower, methodical, logical), and how these different cognitive systems affect us. An excellent primer on how to think, reason, and decide more effectively, which makes accessible over four decades of Nobel Prize-winning research. Effective trading is about making reasoned decisions in a fast, volatile environment. For an example of how event risk and volatility can affect decision-making and financial models, see Roger Lowenstein’s When Genius Failed (Fourth Estate, London, 2002) on the 1998 collapse of the hedge fund Long-Term Capital Management. Unconventional Success: A Fundamental Approach to Personal Investment by David Swensen (New York: The Free Press, 2005). (TS-3). Swensen is the successful investment manager with Yale University’s endowment fund. Unconventional Success distills his insights on the investment process; how to develop an investment portfolio; the different asset classes; and the role of asset allocation over market timing (trading). Swensen — like John C. Bogle (founder of The Vanguard Group), Burton G. Malkiel (A Random Walk Down Wall Street), and others — recommends that you put most of your money into a low-cost index fund like Vanguard or Dimensional Fund Advisers. Swensen’s companion book Pioneering Portfolio Management (The Free Press, New York, 2009) deals with active managers in an institutional funds context. If you want to understand the institutional money management approach, see Richard C. Grinold and Ronald N. Kahn’s Active Portfolio Management (McGraw-Hill, New York, 1999) for quantitative and risk management processes, and Antii Ilmanen’s Expected Returns (John Wiley & Sons, Hoboken NJ, 2011) for asset allocation decisions. The Predators’ Ball by Connie Bruck (New York: Penguin USA, 1989). (TS-3). In the 1980s high-yield or junk bonds led to a mergers and acquisitions bubble. Bruck profiles junk bonds trader and market creator Michael Milken (now a philanthropist) and the major deals that his firm Drexel Burnham Lambert financially engineered. The Predators’ Ball has substantive insights and journalistic reportage on Milken’s thinking and strategies, similar to Lewis (The Big Short) and Mallaby (More Money Than God). This period is also covered in the Adam Curtis documentary The Mayfair Set (1999). This is a cautionary tale of ethics and power: Milken essentially created and monopolized the junk bond market but acted unethically and was involved in the Ivan Boesky scandal. The epochal RJR Nabisco deal is covered in Bryan Burrough and John Helyar’s influential Barbarians At The Gate (Collins Business, London, 2008). For a comparison of Drexel Burnham Lambert with the private equity firm Kohlberg Kravis Roberts see George P. Baker and George David Smith’s The New Financial Capitalists (Cambridge University Press, New York, 1998). Inside Job (Sony Classics, 2010). (TS-3). Charles Ferguson’s Academy Award-winning documentary dissects the 2007-09 global financial crisis and its roots in a housing speculative bubble, the failure to regulate derivatives markets, and a ‘winner takes all’ trading culture. Features interviews with George Soros, Nouriel Roubini, Raj Rajaratnam, and others that summarise complex issues. Million Dollar Traders (BBC2, 2009). (TS-3). European hedge fund manager Lex Van Dam and ex-trader Anton Kreil supervise 8 novices who run a hedge fund in London’s Cass Business School for two months. Several weeks into the project, the 2007-09 global financial crisis begins, and each trader reacts in different ways. Interesting for its use of simulation learning, event arbitrage and how the various personalities deal (or don’t) with stressful situations and uncertain decision-making. In one sequence, the cameras reveal that Kreil is having instant chat messages with outsiders using a producer’s account: Van Dam may actually be trading against the novices. The Mayfair Set (BBC, 1999). (TS-3). Adam Curtis (The Century of the Self, The Power of Nightmares, The Trap, All Watched Over By Machines of Loving Grace) profiles a group of entrepreneurs associated with London’s Clermont Club, including Jim Slater, James Goldsmith and Tiny Rowland. The Mayfair Set documents their stock-market deals and internecine fighting from the late 1950s to the 1980s mergers and acquisitions bubble in the United States. Curtis links together fears about national sovereignty, business cycles, financial innovation, media battles, and luck. Jim Slater’s Return To Go: My Autobiography (Weidenfeld & Nicolson, London, 1977) recounts the Slater Walker years whilst Geoffrey Wansell’s Tycoon: The Life of James Goldsmith (Grafton, London, 1987) is an insightful, semi-authorised account of how Goldsmith pioneered mergers and acquisitions raids and asset management techniques. Last night, I read articles from the 2007-2012 issues of the Journal of Financial Markets (Elsevier). I check-in with this academic research to keep abreast of developments in market microstructure, trading mechanisms, and institutional trading strategies. • Growth managers are momentum traders. • Style neutral and value managers are contrarian traders. • Trades with high price impact – medium sized orders, large trading volume, trade early in morning. • Limited capital – traders tend to use momentum and value strategies. • Morning losses for day-traders – afternoon selling trades – attempt to meet daily price targets. • Psychological biases lead to correlated trading of individual investors – buy stocks with strong recent performance (momentum); refrain from selling stocks held for a loss; and net buyers of stocks with highly unusual trading volumes. US capital and derivatives markets in mid-2008 provide a real-time laboratory for behavioural finance analysts who want to understand the madness and wisdom of crowds. The past week’s case studies include the implosion of the US bank IndyMac and the market volatility triggered by fears that Fannie Mae & Freddie Mac are highly exposed to liquidity risk. As financial reporter Michael S. Rosenwald notes in The New York Times, these recent events appear to fit the behavioural finance hypothesis that individual investors who make fear-driven and risk-averse decisions can trigger pricing shifts as an aggregate rational herd. Guillermo A. Calvo and Enrique Mendoza found in a 1997 paper that globalisation counteracts the emergence of rumour markets based on imperfect information and country-specific knowledge, although not in emerging markets due to uncertainties. However the recent events have different conditions that set delimits on Calvo and Mendoza’s model: the United States is the epicentre of the bear market triggered by the 2007 subprime crisis, Fannie Mae and Freddie Mac have psychological primacy as major financial institutions with US Federal Government backing, and investment media firms such as Bloomberg and CNBC use globalisation to create de facto rumour markets amongst day-traders and others. Readers interested in rational herds should also check out Christopher P. Chamley’s book Rational Herds: Economic Models of Social Learning (Cambridge University Press, Cambridge UK, 2004), excerpt here. Decision researchers are the other early winners of the 2007 subprime crisis, due to the failure of many quantitative models to predict the Black Swan event. Rosenwald mentions Harvard University’s new Bio-Behavioral Laboratory for Decision Science which conducts ‘conducts research on the mechanisms through which emotional and social factors influence judgment and decision making.’ He also refers to the Oregon-based nonprofit group Decision Research. An Australian-based counterpart might be the Capital Markets CRC, an R&D consortia that focuses on ‘new technologies and improvements in market design’. Investment analysts still have divergent opinions on recent events. However the research agenda above prompts several new questions: What happens to rational herds and rumour markets when bio-behavioural methods of decision-making are no longer ‘imperfect information’ but are widely understood and integrated into investment choices? How will markets be redesigned to cope with this eventuality, and who will take on this responsibility? What new financial instruments, markets and products will emerge generativity?